Dr. Bittinger puts his religious beliefs to the same tests and rigor that he requires of his students and demands in his profession. Using mathematical principles and formulas, he examines both truth and paradox from the Bible, historical details and prophecy, the growth in Christian evangelism, the healing power of prayer, String Theory and the Trinity and the numerical application of math in the Bible and more. The result is fresh and originalthe first defense of the Bible and the Christian faith using mathematical concepts. Written in the same approachable style that has made Dr. Bittinger textbooks the overwhelming choice for teaching college students math for the three decades. 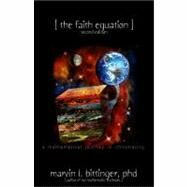 The Faith Equation is a must read for anyone interested in scientific or mathematical evidence of Christianity in the world around them.